The year 2019 for On Global Screens starts on a nostalgic note. However much we love the feel and smell of paper and print, familiar since our childhood, we need perforce to follow the times. We are fashionably late in doing so. With this issue, we say farewell to the written and printed word. Our April 2019 issue will be on the internet, for you to first click, and then download as per your whim and fancy and retain in your memory and thoughts. With that, we live in hope, dear readers. Hope that this shift on to computer screens and servers will not only draw many more eyeballs but that its gateway to payment will maintain its silent flow. 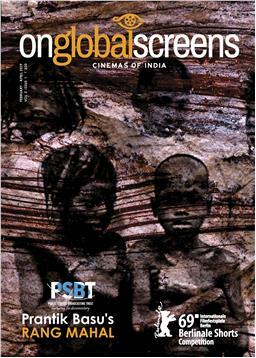 2019’s first issue of the On Global Screen’s magazine spotlights India’s presence at the 69th Berlin International Film Festival, which features as many as nine Indian titles. The highlight is Prantik Basu’s documentary RANG MAHAL in the Berlinale Shorts competition. What’s more, there are two feature film projects in development at Berlin’s Co-Production Market, while Berlinale Talents include nine Indian (and India related) film professionals who are emerging at the forefront of their respective careers. In addition, the magazine’s pages note India-related presence at winter festivals: Sundance, Rotterdam, Victoria (Canada), Göteberg and Palm Springs. Other sections applaud the past year’s independent hits and chart out the ones to look forward to. In focus are two short films, Adoor Gopalakrishnan’s SUKHANTAYAM and Kanu Behl’s BINNU KA SAPNA. And Uma da Cunha pays tribute to the great Bengali filmmaker, Mrinal Sen.